My Little Patch of Sunshine: Wendy's Berry Salad is back! I received an email last week letting me know that the Berry Almond Chicken Salad was back at Wendy's. 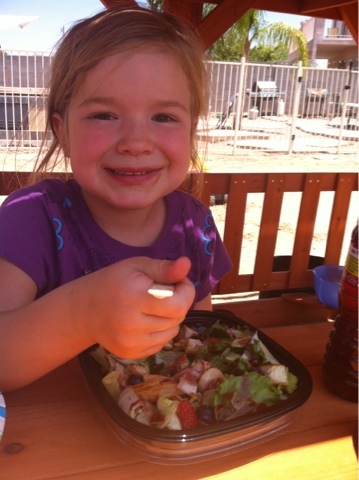 You can see that Lydia also enjoys this salad. (Ok, Lydia enjoys any salad pretty much -- but she likes this one because of the strawberries and the raspberry vinaigrette.) I like the combination of strawberries, blueberries, almonds and grilled chicken -- along with a generous supply of field greens. I like that they are made fresh in the stores, and I like that they're easy to pick up through drive-through when I'm on my way to one of our many activities. This post is just to let you know that this yummy salad is available again -- in both 1/2 and full sizes -- at your local Wendy's Restaurant. Enjoy!